From the global Bubble perspective, it was one extraordinary quarter worthy of chronicling in some detail. The “Everything Rally,” indeed. Markets turned even more highly synchronized – across the globe and across asset classes. As the quarter progressed, it seemingly regressed into a contest of speculative excess between so-called “safe haven” sovereign debt and the Bubbling risk markets. It didn’t really matter – just buy (and lever) whatever central bankers want the marketplace to buy (and lever): financial assets. According to Bloomberg (Decile Gutscher and Eddie van der Walt), it was the best FIRST quarter for the S&P500 since 1998 (strongest individual quarter since Q3 2009); for WTI crude since 2002; for U.S. high-yield Credit since 2003; for emerging market dollar bonds since 2012; and for U.S. investment-grade Credit since 1995. According to the Wall Street Journal (Akane Otani), it was the first quarter that all 11 S&P500 sectors posted gains since 2014. The broader U.S. market gave back some early-period outperformance but posted a big quarter all the same. The S&P400 Midcaps jumped 14.0% and the small cap Russell 2000 rose 14.2%. The average stock (Value Line Arithmetic) gained 14.3% during the quarter. The Bloomberg REITs index rose 15.8%, and the Philadelphia Oil Services Sector Index jumped 17.5%. The Goldman Sachs Most Short Index gained 18.5%. What conventional analysts fancy as “Goldilocks,” I view as acute Monetary Disorder and resulting distorted and dysfunctional markets. For a decade now, coordinated rate and QE policy has nurtured a globalized liquidity and speculation market dynamic. Securities markets have come to be dominated by an unprecedented global pool of speculative, trend-following and performance-chasing finance. The extraordinary central bank-orchestrated market backdrop has over years incentivized the disregard of risk, in the process spurring the move to ETF and passive management – along with a proliferation of leverage and derivatives strategies. The end of the quarter witnessed the first inverted Treasury yield curve (10-year vs. 3-month) since 2007. Ten-year Treasury yields sank 28 bps to close the quarter at 2.40% vs. three-month T-bills ending March at 2.34% (down 7bps y-t-d). The quarter saw two-year Treasury yields drop 23 bps (2.26%), five-year yields 28 bps (2.23%), and 30-year yields 20 bps (2.81%). Five-year Treasury yields dropped an amazing 28 bps in March alone (10-year down 31bps). German 10-year bund yields dropped 31 bps during the quarter to negative 0.07% - the low since September 2016. Japan’s 10-year government yields fell another eight bps to negative 0.08%. Swiss 10-year yields dropped 13 bps to negative 44 bps. Economic concerns supposedly pressuring sovereign yields much lower apparently didn’t trouble the corporate Credit sector. After starting the year at 88 bps, investment-grade CDS ended March at a six-month low 56 bps. The LQD investment-grade corporate ETF returned 6.18% for the quarter, closing March at a 14-month high. According to Bloomberg, BBB’s (lowest-rated investment-grade) 5.82% gain was the strongest quarterly return since Q3 2009. U.S. high-yield returned 7.04%, the strongest start to a year since 2003. The JNK high-yield EFT returned 8.11%, ending the quarter at a six-month high. The quarter began with Chairman Powell’s dramatic January 4th dovish “U-Turn.” After raising rates and holding to cautious rate and balance sheet normalization at the December 19th FOMC meeting (in the face of market instability), such efforts were abruptly abandoned. The Fed will soon be winding down the reduction in its holdings, while markets now assume the next rate move(s) will be lower. It was my view that Chairman Powell was hoping to distance his central bank from the marketplace preoccupation with the “Fed put” market backstop. The Fed’s about face delivered the exact opposite impact. Global markets have become thoroughly convinced that the Fed and global central banking community are as determined as ever to do whatever it takes to safeguard elevated international markets. Moreover, markets have become emboldened by the view that December instability impressed upon central bankers that a prompt wielding of all available powers will be necessary to avert market dislocation and panic. As such, if markets lead economies and central bankers are to respond immediately to market instability, doesn’t that mean safe haven bonds should rally on the prospect of additional monetary stimulus while risk assets can be bought on the likelihood of ongoing loose “money” and meager economic risk? The Central Bank Everything Rally. The Draghi ECB, fresh from the December conclusion of its latest QE program, also reversed course - indefinitely postponing any movement away from negative policy rates while reinstituting stimulus measures (Targeted LTRO/long-term refinancing operation). Even the Bank of Japan, permanently cemented to zero rates and balance sheet expansion ($5TN and counting! ), suggested it was willing to further ratchet up stimulus. Putting an exclamation mark on the extraordinary global shift, the FOMC came out of their March 20th meeting ready to exceed dovish market expectations – booming markets notwithstanding. Message Received. The dovish turn from the Fed, ECB and BOJ flung the gates of dovishness wide open: The Bank of England, the Reserve Bank of New Zealand, the Swiss National Bank, etc. The tightening cycle in Asia came to rapid conclusion, with central banks in Taiwan, Philippines, and Indonesia (at the minimum) postponing rate increases. But it wasn’t only central bankers hard at work. Posting an all-time shortfall in February, the fiscal 2019 U.S. federal deficit after five months ($544bn) ran 40% above the year ago level. But this is surely small potatoes compared to the shift in China, where Beijing has largely abandoned its deleveraging efforts in favor of fiscal and monetary stimulus. After an all-time record January, it will most likely be a record quarter for Chinese Credit growth - monetary stimulus that spurred stock market gains while nursing sickly Chinese financial and economic Bubbles. The Stimulus Arms Race accompanied intense Chinese/U.S. trade negotiations, in the process emboldening the bullish market view of a Chinese and U.S.-led global recovery. My market gains are bigger than yours. With both sides needing a deal, markets had no qualms with stretched out negotiations. The Shanghai Composite surged 23.9%. China’s CSI Midcap 200 jumped 33.5%, with the CSI Smallcap 500 up 33.1%. The growth stock ChiNext index surged 35.4%. Underperforming the broader market rally (as financial stocks did globally), the Hang Seng China Financial Index rose 14.2%. Up 33.7%, the Shenzhen Composite Index led global market returns. Gains for major Asian equities indices included India’s 7.2%, Philippines’ 6.1%, South Korea’s 4.9%, Thailand’s 4.8%, Singapore’s 4.7% and Indonesia’s 4.4%. Losing 1.9% during the final week of the quarter, Japan’s Nikkei posted a 6.0% Q1 gain. Hong Kong’s Hang Seng index jumped 12.4%, and Taiwan’s TAIEX rose 9.4%. Stocks jumped 9.5% in Australia and 11.7% in New Zealand. The MSCI Emerging Markets ETF (EEM) gained 9.9%, more than reversing Q4’s 7.6% loss. Gains for Latin American equities indices included Colombia’s 19.8%, Argentina’s 10.5%, Brazil’s 8.6%, Peru’s 9.0% and Mexico’s 3.9%. Eastern Europe equities somewhat lagged other regions. Major indices were up 12.1% in Russia, 9.0% in Romania, 8.9% in Czech Republic, 6.5% in Hungary, 5.4% in Russia and 3.4% in Poland. It was a big quarter for European equities, with the Euro Stoxx 50 jumping 11.7%. Italy’s MIB gained 16.2% (Italian banks up 12.9%), France’s CAC40 13.1%, Switzerland’s MKT 12.4%, Sweden’s Stockholm 30 10.3%, Portugal’s PSI 11.2%, Germany’s DAX 9.2% and Spain’s IBEX 35 8.2%. Major equities indices were up 17.6% in Greece, 14.1% in Denmark, 12.8% in Belgium, 12.5% in Netherlands, 12.0% in Ireland, 10.8% in Iceland, 10.5% in Austria, 8.5% in Finland and 7.3% in Norway. UK’s FTSE100 rose 8.0%. Especially as the quarter was coming to an end, the divergent messages being delivered by the safe havens and risk markets somewhat began to weigh on market sentiment. Increasingly, collapsing sovereign yields were raising concerns. U.S. bank stocks were hammered 8.2% in three sessions only two weeks before quarter-end, reducing Q1 gains to 9.1%. Portending a global economy in some serious trouble? I view the yield backdrop as confirmation of underlying fragilities in global finance – in the acute vulnerability of global Bubbles – stocks, bonds, EM, China Credit, European banks, derivatives, the ETF complex, and global speculative finance more generally. While risk market participants fixate on capturing unbridled short-terms speculative returns, the safe havens see the inevitability of market dislocation, bursting Bubbles and ever more central bank monetary stimulus. And it wasn’t as if global fragilities receded completely during Q1. The Turkish lira sank almost 6.0% in two late-quarter sessions (March 21/22), with dislocation seeing overnight swap rates spike to 1,000%. Ten-year Turkish government bond yields surged about 300 bps in a week to 18.5%. Turkey CDS jumped 150 bps to 480 bps, heading back towards last summer’s panic highs (560bps). With rapidly dissipating international reserves and huge dollar debt obligations, Turkey is extremely vulnerable. Municipal elections Sunday. A surge in EM flows gave Turkey’s (and others’) Bubble(s) a new lease on life. But as Turkey sinks so swiftly back into crisis mode, worries begin to seep into some quarters of the marketplace that fragilities and contagion risk may be Lying in Wait just beneath the surface of booming markets. The sovereign rally gathered further momentum, while the risk markets saw lower yields and eager central bankers as ensuring favorable conditions. Yet the more egregious the Everything Rally’s speculative run, the more problematic the inevitable reversal. It should be an interesting second quarter and rest of the year. When the US and China catch an economic cold, the eurozone gets influenza. Nobody yet knows quite how serious the slowdown in the world economy is going to be. But the eurozone has, not surprisingly, proved the most vulnerable of the world’s large economies. It is economically and politically crucial that its economy escapes another recession. The authorities need to reconsider their policy stance forthwith. Since the turn of the year, there has been a modest recovery in China, according to forecasts by Gavyn Davies. Even so, growth is slow by its standards. In the US, the probability of a strong expansion has fallen from 80 to 20 per cent for this year. In the eurozone, meanwhile, the probability of a strong expansion has fallen to negligible levels. Its chances of a recession — two successive quarters of negative growth — are estimated at about 25 per cent. This vulnerability of the eurozone to external shocks is no surprise, given the heavy exposure of Germany, its strongest economy, to world trade. Worse, the spectres of sovereign default and “redenomination risk” — that is, a break-up of the eurozone — may re-emerge. In a recent paper, Marcello Minenna of Consob (Italy’s securities regulator) argues that divergent perceptions of credit risk across member states reinforce divergent competitiveness in goods and services. This puts businesses in peripheral countries at a persistent disadvantage, which becomes worse in times of stress. The eurozone is far worse equipped to deal with adverse shocks than, say, Japan. The ECB would never be allowed to purchase government bonds on the recent scale of the Bank of Japan. Yet deflation would gravely damage the effectiveness of monetary policy and create severe stresses in specific member states. Even very low inflation is dangerous enough. That is why the ECB was justified in adopting exceptional measures, including quantitative easing, during Mario Draghi’s presidency. In years to come, radical reforms may reduce the fragility of the eurozone. For now, the burden of minimising the dangers falls mainly on the ECB. Today’s position is really worrying. Core inflation is stuck at close to 1 per cent, while the ECB’s interest rates are essentially zero. What then could it do if an adverse shock caused another big recession? Given all this, it is hard to see a good economic case for ending asset purchases, at least in the absence of other credible policy options. Surely a far bigger effort needs to be made to raise inflation. The explanations seem to be political and legal. The political reason is the hostility to asset purchases in some countries. The ECB is also subject to two quasi-legal constraints. First, holdings of debt should reflect the relative importance of the sovereign issuers, as indicated by their share in the capital of the ECB. Second, holdings of any issuer’s liabilities should not exceed 33 per cent of the total. The aim of that is to minimise the risk of becoming a dominant creditor of any eurozone government. Limits on holdings of any given issue can also be as low as 25 per cent. But last June, ECB holdings of German public debt were already 22 per cent. If the ECB were to continue with large-scale asset purchases it might violate one of its constraints: it would either hold too high a proportion of one issuer’s debt or hold more of that issuer’s debt in its portfolio than the country’s share in its capital. These constraints exist to prevent the ECB from becoming the dominant financier in some cases or from providing especially large support to countries with large debts (such as Italy). Yet it is also possible to argue that further purchases of German debt, with its ultra-low yields, would achieve very little. Assume, then, that substantial further asset purchases are ruled out. What else might manage the downside risks that are emerging for a eurozone that already has ultra-low intervention rates and low inflation? One possibility is fiscal expansion. In Germany that would clearly make a great deal of sense. The country’s determination to eliminate its fiscal deficit has been hard to understand. But for fiscal policy to work across the eurozone, something rather bigger might be needed. One possibility might be for the ECB to buy bonds issued by an EU institution, such as the European Investment Bank, in support of a huge investment programme. The painful truth is that the eurozone is very close to the danger zone, as the combination of persistently low core inflation with the recent economic slowdown shows. It is easy to understand why the ECB felt it should halt asset purchases: it wanted to prove that this was a tool it could use in exceptional circumstances and then cease to use. Yet the constraints upon effective action — both monetary and fiscal — are a permanent danger to stability. It would take just one sizeable negative shock to put the eurozone into another severe crisis. It would be far better if it were much further from the danger zone, especially on inflation. To counter the claim that further unconventional policy is either unwise or illegal, the ancient Romans would have given a simple reply: the safety of the republic is always the supreme law. If the system is not safe, nothing is. WASHINGTON — President Trump is getting exactly what he wants on the economy, but it may not last. The Federal Reserve has abruptly stopped its march toward higher interest rates, as Mr. Trump demanded. The tax cuts he signed in late 2017 are in full swing. His attempt to rewrite the global rules of trade are underway, and he proclaims himself happy with the array of new tariffs he has imposed. His recent comments suggest he is unconcerned about slowdowns in China and Europe, which he considers economic rivals. But while Mr. Trump points with pride to last year’s economic growth and promises even faster growth to come, there are signs that his most dependable talking point is eroding. On Thursday, the Commerce Department issued a downward revision of its estimates for economic growth in the fourth quarter, pushing one measure of the full year’s growth down as well. Forecasters outside the White House, including officials at the Fed, expect growth to slow even more this year. Economic data suggests that slowdown is already underway in the first quarter. Manufacturing is losing some of its steam from last year’s rapid growth, and job creation is also moderating. Chief executives of some of the nation’s biggest companies see investment, hiring and sales growth all slowing this year. Three-quarters of business economists say they are more worried about growth undershooting their forecasts than overshooting it, and half have revised those forecasts downward for this year. White House officials see growth staying above 3 percent for the next few years — and potentially for an entire decade, provided Mr. Trump can continue carrying out his economic agenda, including another round of tax cuts, a $1 trillion infrastructure plan and additional deregulation. Mr. Trump’s re-election could hinge on whether he is right about the economy, and nearly every other forecaster is wrong. If Mr. Trump is correct and growth surges again, he will enter 2020 with arguably the strongest economic record of any incumbent president facing re-election since Bill Clinton in 1996. But if he is wrong and the economy cools, Mr. Trump will have no one to credibly blame — and few places to turn for another jolt of stimulus if the United States slides into an economic contraction or recession. The Democrats who control the House have no desire to pass another round of tax cuts. The Fed, which has slowly raised rates to a range of 2.25 to 2.5 percent, has relatively few tools available to help lift the economy from a sharp downturn. Some Fed officials have begun to warn that they might need to cut interest rates later this year — further reducing the Fed’s ammunition to fight a recession — if growth disappoints. Last week Mr. Trump again raised his bet on his ability to fuel a continuing boom in growth. He said he would nominate Stephen Moore, an architect of his campaign economic platform and a fellow critic of the Fed’s recent interest rate increases, to a seat on the Fed’s board of governors. If confirmed, Mr. Moore would become the first unabashed Trump loyalist on the board, and he would press officials to reduce rates in hopes of pushing annual growth to 4 percent. On Thursday, the Commerce Department said the economy slowed more sharply at the end of last year than previously reported, revising its estimate of fourth-quarter growth to 2.2 percent from 2.6 percent because of weaker spending by consumers and state and local governments, among other factors. While Mr. Trump continues to predict robust growth, he is already trying to pin blame for any slowdown on the Fed, rather than any of his own policies. He added that, “if we didn’t have somebody that would raise interest rates and do quantitative tightening,” we would have been at over 4 percent growth. Fifty-six percent of Americans approve of Mr. Trump’s handling of the economy, Gallup reports, the highest mark of his term and the best for a president since Barack Obama registered the same rating in March 2009. Surveys of consumer confidence remain strong, including a confidence index conducted for The New York Times by the online research firm SurveyMonkey, which has gained strength since Mr. Trump took office. Unemployment has dipped to 3.8 percent. Inflation remains subdued, and wage growth is accelerating. White House economists say the tax cuts Mr. Trump signed in 2017, for businesses and individuals, deserve much of the credit for the economy’s performance — and that they will deliver another strong year of investment and hiring in 2019. “Some folks have said that, ‘Oh, sure, we did have 3 percent growth, but that was a sugar high,’” Kevin Hassett, the chairman of the White House Council of Economic Advisers, said last week. Outside economists are more pessimistic, citing drags on growth from Mr. Trump’s trade policies, slowdowns abroad and a fading consumer spending boost from the tax cuts. Fed officials said this week that their median prediction is now for 2.1 percent growth for the year. Their projections also foresee no interest rate increases in 2019 — down from a forecast of two in December and in line with Mr. Trump’s desire to halt rate increases — and officials announced they would end the reduction of their asset purchase program sooner than markets had expected. Ms. Zentner forecasts 1.7 percent growth this year, largely as a result of slowing investment growth. That would mark a return to the Obama-era growth levels that Mr. Trump has said are now over. Mr. Trump could possibly influence the growth path on his own this year, positively or negatively. He could reach a trade agreement with China, bolstering business certainty and removing tariffs that have hurt American companies and consumers. He could also end tariffs on imported steel and aluminum, which have raised prices for companies that use foreign metals in their products. But Mr. Trump has also threatened to impose new tariffs on imported automobiles and auto parts from Europe and Japan, a move that economists, companies and lawmakers from both parties warn would be economically devastating to the auto industry and its customers. He has negotiated a new trade agreement with Canada and Mexico, but he needs Congress to approve it. Its fate is uncertain. He does not appear to be aggressively pushing for Congress to pass a large-scale infrastructure plan, though he has called for one, and a divided Congress is unlikely to approve one even if he did. A question mark could be government spending. Last year, Mr. Trump signed an agreement between Republicans and Democrats that increased defense and other domestic spending, which helped stimulate demand and growth in the economy. In his budget this year, Mr. Trump called for additional defense increases but cuts in domestic spending, which Democrats are certain to oppose. Complicating the conversation is the widening federal budget deficit, which hit a monthly record in February, according to the Treasury Department, and which the Trump administration predicts will soon top $1 trillion a year. The deficit has ballooned, even in a time of relatively rapid growth, because Mr. Trump’s tax cuts reduced tax revenues — both in absolute terms and compared with forecasts — and because of the spending increases he approved. It is unusual, historically, for presidents to pour fiscal stimulus onto an economy with already low unemployment. The decision to do so could tie Mr. Trump’s hands in a dire situation that most economists deem possible but unlikely — an economic contraction or recession this year. Democrats will be in no mood to give Mr. Trump another tax cut, in that case. The Fed could cut rates, but not by as much as it did in previous recessions. To combat each of the last three recessions, the Fed cut rates by at least five percentage points. Today, the Fed’s target interest rate sits between 2.25 and 2.5 percent. It does not appear to be rising anytime soon. That’s just how Mr. Trump wants it. Ben Casselman contributed reporting from New York. From the beginning it has been all about the Conservatives. First former prime minister David Cameron gambled Britain’s relationship with Europe on a bid for a quieter life from his party’s English nationalists. Now Theresa May promises to hand them the keys to 10 Downing Street if only they support the Brexit accord she has negotiated with Brussels. Never mind the nation’s prosperity or security; forget business and workers. Nothing matters except the Tory party. Mrs May’s offer to step aside is anything but a noble gesture. Her premiership ended some time ago. What she now proposes is a squalid leadership pact in return for the passage by parliament of a wretched deal that would weaken and impoverish Britain. Lend me your votes, the prime minister is saying to the kamikaze Brexiters, and you can seize control of the second phase of Brexit. You can go on re-fighting the second world war for as long as you like — throw up the barricades, demonise the Germans and insult the French to your hearts’ content. The bargain takes the measure of Mrs May’s dismal leadership; a vivid testimony to a stubborn, weak and blinkered leader. Boris Johnson, who forever imagines himself as Winston Churchill, has consistently lacerated the prime minister’s deal. Mrs May, the former foreign secretary has said 100 times, wanted to sign up to terms promising vassalage. A thousand years of proud British democracy would be erased at a stroke and the nation reduced to the status of an EU colony. The world has seen nothing so ruinous since the sacking of Carthage. And now? Well, what would you expect of a politician who has lied and cheated his way through life? The promise of a vacancy at the top has changed things. Mr Johnson has decided he will back the deal after all. Mrs May cannot see beyond the narrow interests of her party. Her would-be successor is consumed by an obsessive ambition to be prime minister. Whether this latest swerve will get the deal over the line in the House of Commons is less certain. To my mind, the road to Brexit looks as impassable as it has ever done. Thirty-three months after the referendum, one or two things should be obvious. The Tories, once known for the pragmatic pursuit of power, have been broken on the anvil of English nationalism — ready to gamble even the future of the union of the UK to sate their disdain for Europe. Forget the Brexiters’ guff about a new “global” Britain. The hardliners sing from the same jingoistic hymn sheet as do far-right populists across western democracies. Mrs May’s government is beyond repair. It lacks the prerequisites for a functioning administration: a leader capable of exercising authority, a modicum of trust and discipline within the cabinet, and a rough consensus on policy objectives. Whitehall insiders speak of the prime minister as an automaton, unwilling or unable to absorb realities, of Brexiter ministers refusing to admit inconvenient truths, and a complete breakdown of collective responsibility. The code of conduct issued to ministers includes a list of seven principles of public life. The first is clear and succinct: “Holders of public office should act solely in terms of the public interest.” In her handling of Brexit, Mrs May has done everything but that. From cabinet downwards, ministerial discussions and debates are directed at the interests of the Tory party. With an eye on posterity (and a likely future public inquiry into the Brexit debacle), some officials have taken to filing away written notes of the most egregious breaches. Even the official cabinet minutes carry references to contributions framed around party rather than public interest. Mrs May hopes her Faustian pact has given her one last shot of getting her deal through the House of Commons. Many erstwhile rebels have joined Mr Johnson and fallen into line, and there is Treasury money on offer to Northern Ireland’s Democratic Unionist party if its 10 MPs drop their opposition. I struggle to see the prime minister assembling a majority, even with the support of some Labour MPs. I wonder whether the outcome matters any longer. Victory once is not enough. To take the necessary legislation through parliament, Mrs May would have to win a succession of votes over several weeks. That is surely beyond her. To the extent that parliament has seized the initiative, this week’s indicative votes have opened up a possible alternative to Mrs May’s plan. They point to a softer Brexit with closer economic engagement with the EU27. The ambition for a customs union could be added to the political statement on the future relationship that sits alongside Mrs May’s withdrawal agreement. How she could reverse her opposition to a customs union is a harder question. Some in Whitehall see a renewed risk of Britain crashing out of the EU. My intuition says that the cabinet and the civil service, with the backing of a Commons majority, would act to prevent such an outcome — in extremis by revoking Article 50. To borrow a phrase, it is time to take back control. It is all but impossible to reach a half-sensible agreement against the present deadlines. The case for a referendum looks irrefutable. Mrs May’s government cannot bear the weight of its contradictions much longer. A general election looms ever closer on the horizon. Brexit has brought Britain to its knees. Mrs May’s promise to scuttle out of Downing Street will solve nothing. But it’s less clear how much AI will advance, exactly. It may only be able to perform fairly menial tasks like classifying photographs, driving, or bookkeeping. There’s also a distinct possibility that AI will become as smart as humans or more so, able to make complex decisions independently. A race toward a technology with such a range of possible final states, stretching from banal to terrifying, is inherently unstable. A research program directed toward one understanding of AI may prove to have been misdirected after years of work. Alternatively, a plan to focus on small and achievable advances could be leapfrogged by a more ambitious effort. China is pursuing the most aggressive strategy, focusing on developing advanced AI that could contribute to strategic decision-making. The U.S. approach is more conservative, with the goal of producing computers that can assist human decision-making but not contribute on their own. Finally, Russia’s projects are directed at creating military hardware that relies on AI but leaves decisions about deployment entirely in the hands of generals. In all three situations, the forms of AI these governments are investing their resources in reveal their expectations of the technological future. The country that gets it right could reap huge benefits in terms of military might and global influence. When China’s State Council released the New Generation report in 2017, its ambition to create a technological infrastructure capable of churning out AI technologies no one else possesses greatly amplified talk of an AI arms race. The report recognizes that the exclusive control of a technology has the potential to open up a “first-mover advantage,” which allows a nation to make, and consolidate, gains before competitors can catch up. A doctrine developed by the People’s Liberation Army called “intelligentization” guides much of the plan by envisioning the future uses of AI. The Chinese army sees computers as a way to respond to the vast amount of information available to the commanders of modern armed forces. Precise GPS locations of all one’s own units, as well as drone and satellite reports on the adversary’s, provide too much information for human cognitive capabilities. To alleviate this problem, the New Generation report commits to creating “strong supports to command and military decision-making [and] military deduction.” Strong, generalized AI—systems able to outperform humans in complex, changing environments—could process much more battlefield information than humans can, giving the military in control a substantial advantage over those with less ability to utilize information. But a great deal more research is needed before an AI system advanced enough to represent the fluctuating circumstances of a battlefield and advise commanders is possible. By contrast, U.S. national security circles seem to doubt AI will be capable of human-level thinking in the near future. In an interview late in his second term, then-U.S. President Barack Obama said, “my impression, based on talking to my top science advisors, is that we’re still a reasonably long way away” from “generalized AI”—just what the Chinese army has been theorizing about. Instead, Obama argued that the continued development of “specialized AI,” i.e., programs with one narrow use, was the most pragmatic course for innovation in the near term. Trump’s recently announced American AI Initiative seems to proceed from the same assumptions. The plan doesn’t introduce many concrete measures, mostly directing sub-departments to prioritize AI and share their data. The most substantial indications of the U.S. view on AI’s national security impact come from the “Third Offset Strategy,” developed and initiated by Bob Work and Ash Carter, two Department of Defense officials, during Obama’s time in office. The plan has a strong focus on “human-machine collaboration,” in Work’s words. Rather than creating fully autonomous systems, the emphasis is on systems in which machines provide data and analysis to human operators, who then take action. This “teaming” is meant to use “the machine to make the human make better decisions” than either computers or humans could have made in isolation, according to Work. For example, one Pentagon project is using “computer vision” to assist human drone operators by analyzing the incoming video feeds and identifying targets. Using AI to provide data to people who then make decisions themselves is a more achievable task than creating more autonomous technologies. The U.S. approach—working with extant technology and avoiding overenthusiasm about what might come next—could ensure maximum advantage from current capabilities. A strategy of incremental progress risks being overtaken by those pursuing transformative leaps , however. Some of the applications of AI being pursued move in the direction of intelligentization, but never fully commits to the undertaking. This leaves the U.S. conceptualization of AI somewhere between a mere resource and a technology capable of making strategic contributions. Like China, the United States also plans to rely on the private sector to develop AI for the national security domain. Applications of deep learning in the private sector—facial recognition software, object classification—also have many national security applications, including use in drones and population monitoring. The U.S. tech sector is the largest and most advanced in the world. However, the tech industry’s nearly unfettered capitalism—the overriding concern for shareholders, hostility to regulation and government oversight, and distrust of other firms—presents challenges to public-private partnerships. These competitive pressures make it unlikely that Google and Facebook would share trade secrets, even if it would advance U.S. national interests. In China’s hybrid economic system, some large tech companies retain strong ties to the government and are willing to collaborate with one another in a national team. There are also disincentives to entering into public-private partnerships, as the furor over Google’s involvement with the Pentagon showed. Thousands of Google’s own employees signed a petition demanding the company cease contributing to Project Maven, a military effort to use AI to process video from drones. The Russian vision for AI is less ambitious than those of China and the United States. Its policy has a clear focus, the narrowest of the three, on applying AI to military hardware. The goal is not to create ways to make better decisions, but simply to make better weapons. The projects do not rely on particularly complex AI systems, reducing the amount of research needed to get off the ground. For example, one much-publicized project is a self-guided missile able to change course midflight, meant to evade missile defenses. Kalashnikov, Russia’s most famous arms manufacturer, is developing stationary machine guns that use neural networks to choose and engage targets. Once placed and activated, these turrets would be able continuously scan an area, take aim at any intruders, and fire, all without human input. These technologies are an attempt to refine conventional weapons using the possibilities afforded by AI, without pushing the envelope much further. The limited scope of the Russian program, relative to those of China and the United States, is a consequence of a lack of opportunity as much as strategic outlook. The Russian digital economy is much smaller than those in the United States and China, leaving the government without strong tech partners. Instead, the Russian defense industry is leading the research and application of AI. The close links between the Kremlin and the defense industry have aided a generation of so-called bespoke weapons. The state owns a controlling stake in the Kalashnikov group and the entirety of Tactical Missiles Corporation, which is creating the self-guiding missiles. As in China and the United States, Russia’s strategy leverages features of its domestic economy into its AI program. Although it’s unlikely Russia could compete in a race toward complex, human-level AI, it could certainly contend in a more traditional arms race. This would be a technological race as well as a material one as the large militaries of the world compete for better applications of AI as well as volume. A comparatively smarter drone or submarine could lose to a greater number of less independently thinking ones. In truth, both these races are occurring at once, since nations pursuing revolutionary AI still need to invest in less advanced alternatives as insurance. The relative importance of these two races depends on whether strong AI is possible—and when. In surveys of experts conducted between 2011 and 2013, Vincent Müller and Nick Bostrom found that many thought strong AI will be achieved fairly soon; the median prediction for a 50 percent chance of success was 2040, with an assessment of a 90 percent likelihood by 2075. Another survey, published in 2018, found that some experts believed there was “a 50% chance of AI outperforming humans in all tasks in 45 years.” In both surveys, however, some experts doubted human-level AI is possible, and many who did support its chances put the date hundreds of years in the future. In the absence of a reliable way to settle these questions, nobody knows who’s ahead. Uncertainty over opponents’ capabilities in an arms race can act as a dangerous accelerant, pushing governments to devote ever more resources and to accept more risky applications of those technologies. During the Cold War, imperfect information and mutual suspicion drove stockpiles of nuclear weapons higher and higher. Secrecy and obfuscation led to exaggerations of the capabilities of others, motivating heavy-handed responses. However, the lack of insight into the nature of AI faced by today’s leaders is different from informational challenges during the Cold War. Policymakers aren’t confused about the quantity of adversaries’ capabilities but about their future capabilities after years of research and development. If AI achieves superhuman levels of intelligence, it would revolutionize the global balance of power and relegate the losers to a permanent second-class status. As knowledge about AI advances, the race will increasing resemble the nuclear buildup of the Cold War. Although there was uncertainty over the magnitude of nuclear capabilities, what missiles could do was clear, as was the impact of a gap of this or that many. U.S. fears of a “missile gap” in both the late 1950s and 1970s motivated buildups. After those buildups, the Soviets, fearful of losing a nuclear confrontation, stockpiled biological weapons despite international bans and deadly accidents. The risk of being unexpectedly overcome will fade with an understanding of the necessary steps to build strong AI. Those nations that fall far behind may have to resort to desperate measures, like rushing unsafe technology into testing or application. Leaders may be forced to consider preemptive actions in order to stymie an adversary’s development, by way of hacking or sabotage of computing resources, even if those steps invite escalation. Clarity will intensify competition. In the next few years, a race that can only destabilize relations between major powers can still be stemmed. The less that’s known, the less certain each nation can be that its strategy is the correct one. Much like hedge funds, governments recognize the prudence of keeping risk within acceptable parameters, accepting some, but avoiding irresponsible gambling. All participants in this technological race would benefit from controlling competition, because they would no longer risk losing. Recently, Xi Jinping and Liu He, China’s premier and vice premier, have called for greater collaboration in AI research. They’ve offered to share the results of basic AI research with “the global village,” which, if reciprocated, would ensure that no one country achieves a decisive strategic advantage based on a surprise scientific breakthrough. Countries and companies would still compete over how best to apply the basic frameworks discovered through research, but it would take place on a more level playing field. Hopefully, the leaders of other countries respond to these overtures in kind, taking the opportunity to halt this nascent arms race. There are many barriers to cooperation: International competition in AI is not insulated from other contentious issues, including trade and nuclear arms control, that separate the aforementioned countries. But if they feel enough urgency, leaders could put aside some issues in order to agree to cooperate on AI. By the time sufficient urgency develops, however, one worries the race will be too far along to stop. Adrian Pecotic is a freelance writer based in Sarajevo. He has also written for The Blizzard Quarterly and Mental Health Today. Blackstone has slapped golden handcuffs on one of its most senior executives, Bennett Goodman, in a bid to prevent the co-founder of the investment group’s $130bn credit business from following his two original partners out of the door. The sweetened deal, agreed in November, provides faster vesting of a $200m share award dating from 2015, when Mr Goodman joined Blackstone’s board of directors. He has also been promised that he will not be paid less than Dwight Scott, a former underling who was named president of the credit unit in 2017. It comes as Mr Goodman’s fellow GSO co-founders, both of whom have already left Blackstone, press on with their own investment platforms — in at least one case luring a former senior Blackstone colleague to help build the new firm. In addition to providing financial assurances, Mr Goodman’s new deal guarantees him five weeks’ holiday a year and promises a package of benefits that will match whatever Blackstone offers its other senior managing directors, with the exception of chief executive Stephen Schwarzman. The unique package of Mr Schwarzman, who founded Blackstone in 1985, allows him to keep his current office in Blackstone’s midtown headquarters even after he retires and has been promised free access to a car and driver for the rest of his life. Mr Goodman cut his teeth at junk bond king Michael Milken’s Drexel Burnham Lambert in the 1980s. He founded GSO with Tripp Smith and Doug Ostrover in 2005, selling the firm to Blackstone in 2008 for about $1bn. Since then, GSO has become one of the biggest, most profitable alternative credit providers, helping Blackstone become a diversified financial giant. The firm now manages more money in debt investments than in its traditional buyout funds, and traders say the firm has enough heft to displace top banks such as Goldman Sachs, which once called the shots in financial markets. The changes to Mr Goodman’s pay, which also offer him new sweeteners for five years after he retires from Blackstone, were made at a time of increased speculation about the future of GSO’s only remaining founder. Mr Ostrover left in 2015 and has since formed Owl Rock alongside former dealmakers from investment bank Goldman and rival private equity firm KKR. The fledgling firm has written $8.6bn worth of loans so far, focusing on medium-size private equity-backed companies. Mr Smith left last year and is in the early stages of raising his own rival credit fund. He has already poached at least one other senior GSO executive. The credit fund manager’s chief operating officer George Fan, who had been with GSO since its inception in 2005, left his role at the start of the year, and has agreed to join Mr Smith’s new firm, according to two people familiar with the matter. Mr Smith did not immediately respond to a request for comment. Under the new deal Mr Goodman’s shares will vest four times a year instead of annually, a concession that companies often use to persuade executives to defer decisions about a potential departure. Mr Goodman’s shares vest over an eight-year period ending in 2023. A person close to Mr Goodman said he was happy at Blackstone and has no intention of joining Mr Smith or Mr Ostrover. One person close to GSO said there had been a “changing of the guard” at the top of the firm over the past year, noting a string of senior departures in the group’s once imposing distressed debt unit. Blackstone has looked to move away from the often controversial practices this unit became best known for, particularly after an aggressive trade involving the debt of homebuilder Hovnanian drew the ire of US regulators last year. As part of the changes, Mr Scott, a former investment banker who was chief financial officer of energy group El Paso Corporation before joining GSO in 2005, has also taken on a more visible role. He has led efforts to seed new products with capital from major clients, according to a person with knowledge of the discussions, who added that until recently negotiations of this type were usually led by Mr Goodman. Blackstone’s deal with Mr Goodman, which it called a “new multiyear retention arrangement”, has been made public in company filings under rules requiring disclosure of material contracts involving a company’s directors. Mr Goodman’s previous deal, struck before he became a director, has not been disclosed. PARIS – Never, since World War II, has Europe been as essential. Yet never has Europe been in so much danger. Brexit stands as the symbol of that. It symbolises the crisis of Europe, which has failed to respond to its peoples’ needs for protection from the major shocks of the modern world. It also symbolises the European trap. That trap is not one of being part of the European Union. The trap is in the lie and the irresponsibility that can destroy it. We have to stand firm, proud and lucid, in the face of this manipulation and say first of all what today’s united Europe is. It is a historic success: the reconciliation of a devastated continent in an unprecedented project of peace, prosperity and freedom. We should never forget that. And this project continues to protect us today. What country can act on its own in the face of aggressive strategies by the major powers? Who can claim to be sovereign, on their own, in the face of the digital giants? How would we resist the crises of financial capitalism without the euro, which is a force for the entire European Union? Europe is also those thousands of projects daily that have changed the face of our regions: the school refurbished, the road built, and the long-awaited arrival of high-speed Internet access. This struggle is a daily commitment, because Europe, like peace, can never be taken for granted. 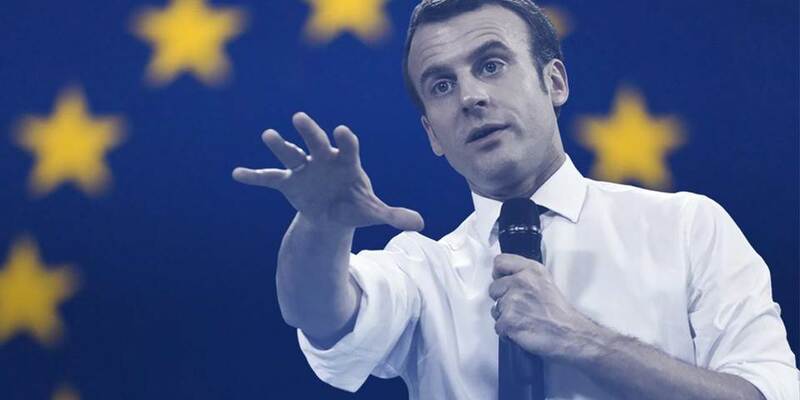 I tirelessly pursue it in the name of France to take Europe forward and defend its model. We have shown that what we were told was unattainable, the creation of a European defence capability and the protection of social rights, was in fact possible. Yet we need to do more and sooner, because there is the other trap: the trap of the status quo and resignation. Faced with the major crises in the world, citizens so often ask us, “Where is Europe? What is Europe doing?” It has become a soulless market in their eyes. Yet Europe is not just a market. It is a project. A market is useful, but it should not detract from the need for borders that protect and values that unite. The nationalists are misguided when they claim to defend our identity by withdrawing from Europe, because it is the European civilisation that unites, frees and protects us. But those who would change nothing are also misguided, because they deny the fears felt by our peoples, the doubts that undermine our democracies. We are at a pivotal moment for our continent, a moment when together we need to politically and culturally reinvent the shape of our civilisation in a changing world. It is the moment for European renewal. Hence, resisting the temptation of isolation and divisions, I propose we build this renewal together around three ambitions: freedom, protection and progress. The European model is based on the freedom of man and the diversity of opinions and creation. Our first freedom is democratic freedom: the freedom to choose our leaders as foreign powers seek to influence our vote at each election. I propose creating a European Agency for the Protection of Democracies, which will provide each member state with European experts to protect their election processes against cyber-attacks and manipulation. In this same spirit of independence, we should also ban the funding of European political parties by foreign powers. We should have European rules banish all incitements to hate and violence from the Internet, since respect for the individual is the bedrock of our civilisation of dignity. Founded on internal reconciliation, the EU has forgotten to look at the realities of the world. Yet no community can create a sense of belonging if it does not have bounds that it protects. The boundary is freedom in security. We therefore need to rethink the Schengen area: all those who want to be part of it should comply with obligations of responsibility (stringent border controls) and solidarity (one asylum policy with the same acceptance and refusal rules). We will need a common border force and a European asylum office, strict control obligations and European solidarity to which each country will contribute under the authority of a European Council for Internal Security. On the issue of migration, I believe in a Europe that protects both its values and its borders. Getting back on track with progress also concerns spearheading the ecological cause. Will we be able to look our children in the eye if we do not also clear our climate debt? The EU needs to set its target – zero carbon by 2050 and pesticides halved by 2025 – and adapt its policies accordingly with such measures as a European Climate Bank to finance the ecological transition, a European food safety force to improve our food controls and, to counter the lobby threat, independent scientific assessment of substances hazardous to the environment and health. This imperative needs to guide all our action: from the European Central Bank to the European Commission, from the European budget to the Investment Plan for Europe. All our institutions need to have the climate as their mandate. Progress and freedom are about being able to live from your work: Europe needs to look ahead to create jobs. This is why it needs not only to regulate the global digital giants by putting in place European supervision of the major platforms (prompt penalties for unfair competition, transparent algorithms, etc. ), but also to finance innovation by giving the new European Innovation Council a budget on a par with the United States in order to spearhead new technological breakthroughs such as artificial intelligence. Freedom, protection and progress. We need to build European renewal on these pillars. We cannot let nationalists without solutions exploit the people’s anger. We cannot sleepwalk through a diminished Europe. We cannot become ensconced in business as usual and wishful thinking. European humanism demands action. And everywhere, the people are standing up to be part of that change. So, by the end of the year, let’s set up, with the representatives of the European institutions and the member states, a Conference for Europe in order to propose all the changes our political project needs, with an open mind, even to amending the treaties. This conference will need to engage with citizens’ panels and hear academics, business and labour representatives, and religious and spiritual leaders. It will define a roadmap for the EU that translates these key priorities into concrete actions. There will be disagreement, but is it better to have a static Europe or a Europe that advances, sometimes at different paces, and that is open to all? The Brexit impasse is a lesson for us all. We need to escape this trap and make the upcoming European Parliament elections and our project meaningful. It is for Europe’s citizens to decide whether Europe and the values of progress that it embodies are to be more than just a passing episode in history. This is the choice I propose: to chart together the road to European renewal. Emmanuel Macron is President of France.